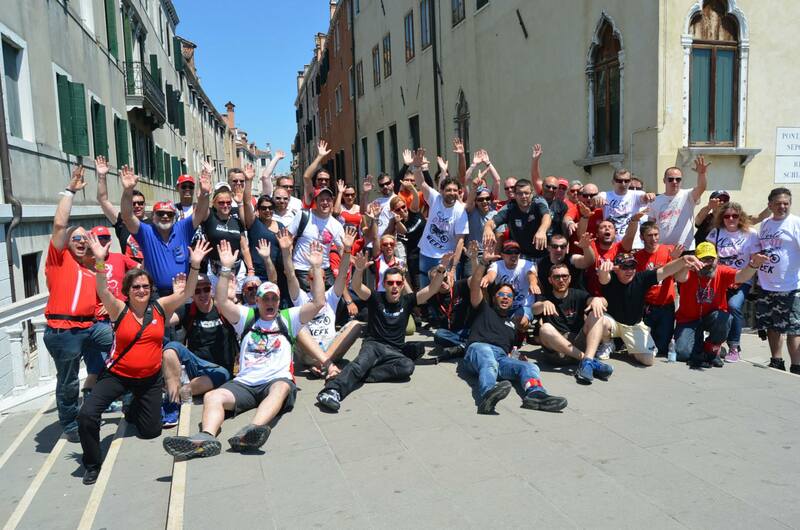 Day 6 – Verona to Misano via Venice | Ducati Sporting Club – Blogs! Today was the last day of our World Presidents Meeting tour and the main part of the day would be a trip to Venice. We were not far from Venice so it took us just over an hour along the motorway to arrive at a car-park just outside the city where we would catch the boat to the centre. We had all packed a “day bag” with suitable clothes as it was now too hot to walk around in riding gear, so once we had all changed and stowed the riding gear in the support van we headed to the boat. A short boat ride later and we were in the middle of Venice and free to roam about. We took a few pictures as a group and then went our separate ways to explore Venice and walk around the city before heading back to the meeting point for a boat tour and lunch. The boat tour took us around the main lagoon of Venice, giving us the history of the area as well as Venice. It’s interesting to see how many of the homes use boats just like cars, even having their own “driveway” mooring in their gardens! Before long we were saying goodbye to Venice and were back at the bikes getting ready for the last ride down to Misano and our hotel for the next few days while we attend WDW2014. We were supposed to be going via Bologna and possibly a factory tour, but unfortunately time was against us and the coast road we were taking to Misano was notoriously bad for traffic, so our guides opted to push on instead. The road to Misano was pretty dull but we had to laugh as we were approaching traffic as there was a large grey Audi that kept moving right over to the left, to the centre of the road, and it was causing some of the bikes to hang back to make sure the road was clear. Spotting my chance, I cracked open the Diavel and it powered past the line of cars without problem and glance into the Audi as I went past to see a nice young lady in the seat … but no steering wheel! I tucked back into traffic in front of the Audi and checked my mirrors and noticed that the Audi was actually on a UK ’63 plate! That explained why he kept moving over as the driver was on the wrong side and couldn’t see the oncoming traffic! A brief chat on the bike-to-bike intercom with our last-man, who happened to be on a UK plate as well, and we gave the Audi a cheery wave and gunned it past the next line of lorries. To our surprise, looking back the Audi had followed us and was doing pretty well at keep pace with us through the traffic! After a few more overtakes we realised he was sticking with us so from that point on our last man was helping the Audi to follow us on overtakes. Eventually we had to turn off for a petrol stop and we waved the Audi past as he sped on with a lovely deep rumble that meant it must have been a top-of-the-line S8 or similar. The last few miles to our hotel, just outside Misano at Gabicce Monte, were uneventful and we all arrived rather hot from the ride back. 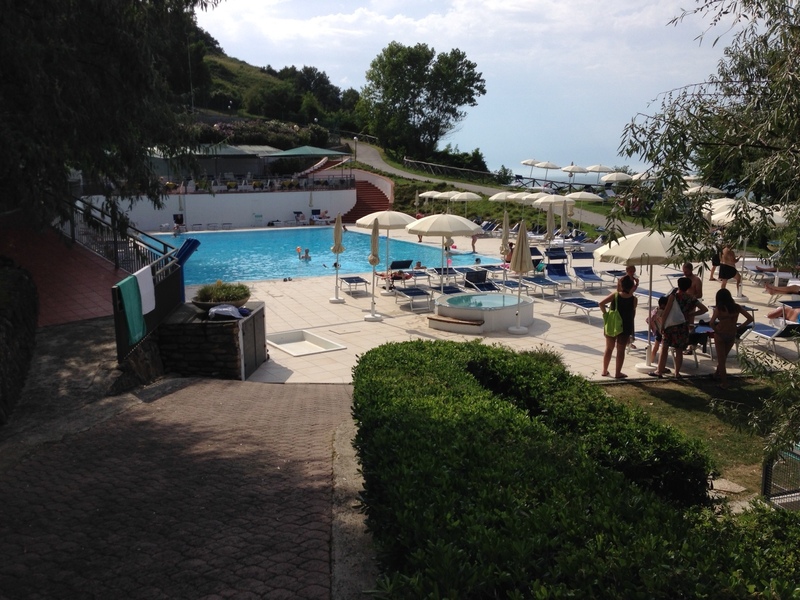 Fortunately the hotel had a pool so we opted for a quick dip before the Clubs welcome dinner for the evening. 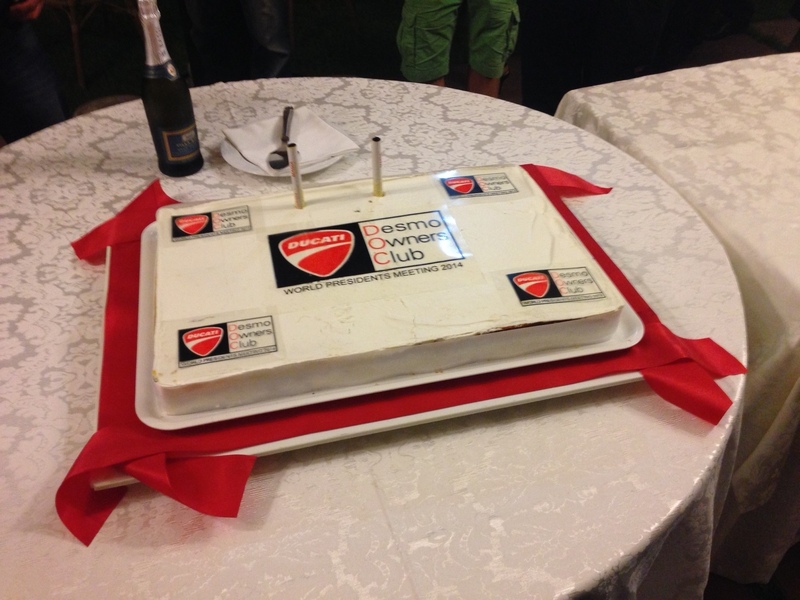 The evening event was a huge dinner organised by the local Romagna clubs to celebrate another WDW, and included a fantastic bbq-style buffet with drinks and a massive DOC cake! It was another great chance to chat with other clubs, speak to clubs you already knew and share time with old friends. It really did make you feel welcome and that you are part of the larger DOC family. Tomorrow we begin three days of WDW2014, which will include some Club/Presidential duties, but hopefully will be a great time at the track and the evening events. Finally we return back to the Factory at Bologna on Monday after WDW and head back home. This entry was posted in Chairman, WDW2014, WPM2014 by antonye. Bookmark the permalink.